One Student. One Teacher. One Revolutionary Difference! At Back to Basics K-12 Private School, your child can have that 1-on-1 teacher interaction every single day. 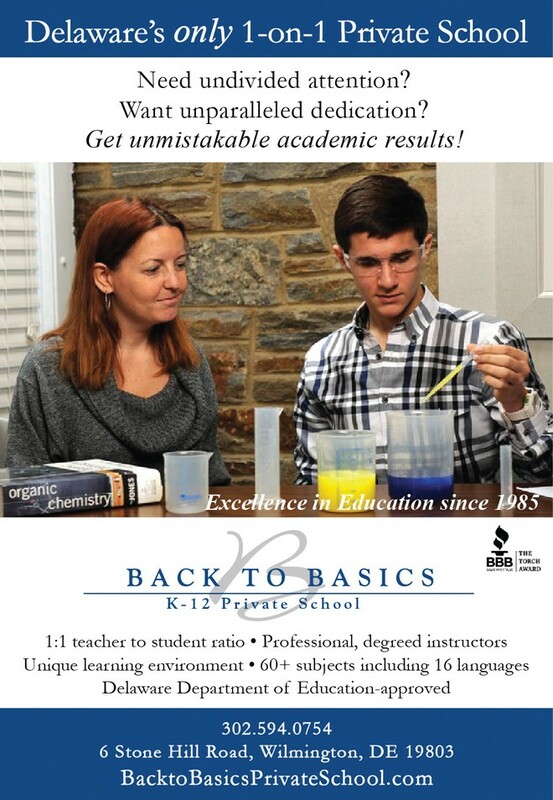 Back to Basics offers a school experience like no other and is Delaware’s only Department of Education-approved 1-on-1 Private School. The experienced and degreed instructors at Back to Basics K-12 Private School work together as a team to customize and tailor an integrated curriculum to meet the unique needs and abilities of your child. The teaching staff is dedicated to the growth and development of your child academically, socially, mentally and emotionally. Back to Basics K-12 Private School offers the four core curriculum areas of English/language arts, math, social studies and science, as well as electives for all grades. Electives include foreign languages (16 offered), business courses, psychology, study skills, art, music, drama, computer literacy, and over 50 other subjects. My child struggles to pay attention in a crowded classroom. Can a 1-on-1 school help him focus? Your child may benefit from an innovative 1-on-1 approach to learning. Since students are able to move at their own pace and teachers are not focused on a range of skill levels found in a traditional classroom, the sky’s the limit! In addition to core curriculum, your child may want to explore a broader range of electives or Honors courses not offered at the school he is currently attending – from Mandarin Chinese, to Anatomy, to Art History. My child is currently pursuing a future career while still in school. How can a 1-on-1 school help simplify our hectic life? If your student is actively pursuing a career in acting, modeling, dance, or sports, congratulations! Hard working students like yours have a host of additional challenges when enrolled at a traditional school, the least of which is simply scheduling. Back to Basics’ 1-on-1 setting can allow your child to more easily fulfill school requirements while juggling auditions, work, games, practice or travel. School hours can be adjusted to outside obligations, so that no assignments or class time are missed. And, because Back to Basics K-12 Private School is a Delaware Department of Education-approved school, seniors graduate with a high school diploma. Every student deserves an environment conducive to him or her. The experienced instructors at Back to Basics join forces to create a unique environment where your child can learn — and feel good about school. The results can be transformative! After one to three years, Back to Basics K-12 Private School students confidently return to a traditional school setting or graduate. Whether your student has a chronic condition, emotional challenges, or has a short-term medical issue, a 1-on-1 school may be the answer. Back to Basics K-12 Private School offers a uniquely caring and supportive academic environment with scheduling flexibility to ensure your child’s academic success.